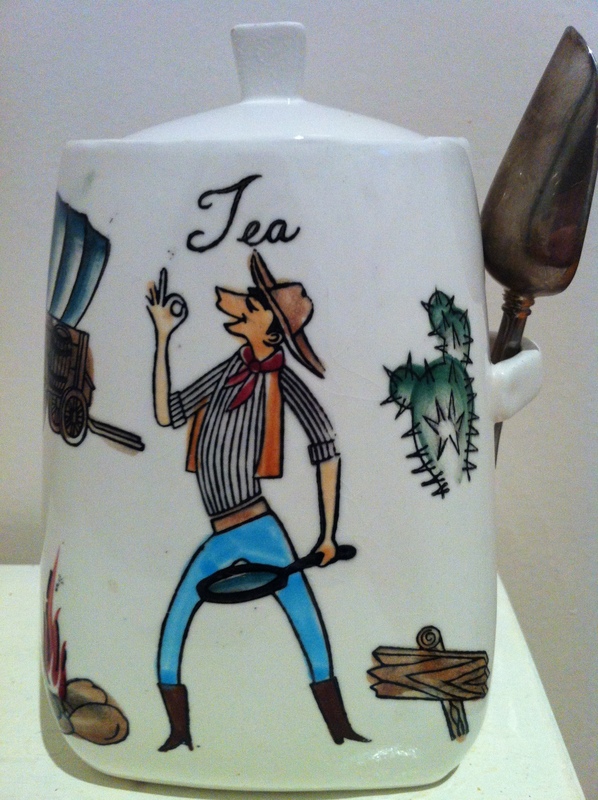 Goodness only knows why a cowboy wielding a frying pan dispenses my loose-leaf tea, but apparently the 1950s/60s Japanese manufacturers considered it to be the height of kitchen chic to do so. Being a Twinings tea-bag girl, it’s not often that this canister makes an appearance from the back stalls of the pantry, but on the occasions when a teapot brew is called for, gosh it makes me smile. Making a pot of tea signifies a break in the daily journey – a segment of life dedicated to ‘right now’. The ritual of tea making – warming the pot, allowing the leaves to steep and carefully straining as you pour – necessitates a slower pace and time to consider. There is nothing instant about this process. It is no coincidence that a slice of fruit loaf tastes so good with a cup of tea – rather than when it is consumed unconsciously on-the-fly amidst email checking or grocery unpacking. While your tea settles to drinking temperature, there is time and attention made available to savor each morsel. In the company of friends I am more inclined to fill the teapot as it suggests multiple refills and an extension of conversation, an atmosphere the one-tea-bag-per-cup alternative fails to achieve. It may have been a while since last you saw your teapot. If this is so, in the coming week I encourage you to seek it out, allow it to pour you a decent cup of peace and place that well-deserved comma in the lengthy sentence of your day. Postscript: I’m sure my tea canister is one of a series, possibly having siblings named rice, flour and sugar – would love to organise a family reunion someday. i was thinking about where he has the frying pan to fry? dangerous lol i like a cup of tea leaf brew and tea bags too, i have been drinking dandelion coffee lately, no caffeine in it.